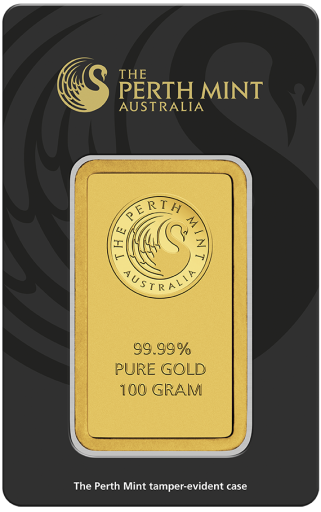 The 100g gold bullion bar from Australia's renowned Perth Mint is the ideal investment for serious precious metal collectors or those looking for a safe haven for capital. Each beautifully struck gold bar bears the mint's magnificent swan logo, a symbol that is synonymous with quality and purity. The purity and weight are displayed under the logo and the reverse of the bar features the mint's iconic leaping kangaroo pattern in reference to the country's gold mining history. Gold has been mined commercially since 1851 in the Outback and Australian gold is still considered some of the finest in the world today. When you buy gold of this calibre from CoinInvest.com you are assured of an asset that will increase in value over the coming years. Each of these 100-gram bars is supplied in assay card secure packaging featuring a unique serial number and authentication of the gold content and purity from the chief assayer. As a trusted Perth Mint distributor, CoinInvest.com is ideally placed to offer its customers the 100g investment bar at the most competitive price. We are committed to finding the very best investment opportunities for our clients and all orders are delivered quickly.